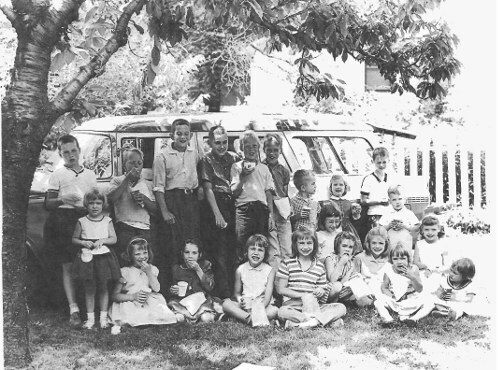 The Unitarian Fellowship of Lima began in the fall of 1954 when a small group of local people met with Monroe Husbands, a representative of the American Unitarian Association of Boston, to form the Unitarian Fellowship of Lima, Ohio. Three months later, in February 1955, the Fellowship became affIliated with the American Unitarian Association. Otto Austin became the first president. The group held Sunday services the next four years in various locations: the YWCA, the Crystal Room of the Argonne Hotel, Robin Rogers School and Bradfield Center. These founding members, soon joined by other families and individuals, developed a caring fellowship with a free pulpit in which all points of view can be expressed and are welcome. Members and visitors discuss ideas on a quest for truth, trying to make sense and get direction in a sometimes confusing world. We seek to behave ethically by translating religion into everyday social and business relationships. From the beginning, religious education for the children as well as for the adults has been a major focus along with the establishment and maintenance of a local organization responsive to liberal religious thought. 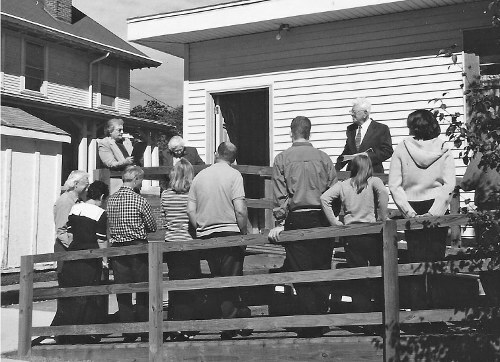 In February 1959, the Unitarian Fellowship of Lima (by then incorporated) purchased and moved into the Dr. Parent property at 875 West Market Street, an early 1900's structure. Dr. Oscar Quimby, President of the Ohio Valley Unitarian Conference from Cincinnati, and the Rev. Waldemar Argow, Minister of First Unitarian Church of Toledo, conducted the dedication service. In 1961 the American Unitarian Association (organized in 1825) merged with the Universalist Church of America (organized in 1793) to form the Unitarian-Universalist denomination. The Lima congregation studied the beliefs, principles and service commitments of the new organization and informally adopted the name Unitarian Universalist Fellowship. Two Unitarian ministers have come from this small Fellowship Charles Grady, one of our original members, left his radio broadcasting career to attend Meadville Seminary at the University of Chicago, and was was ordained in 1966 by White Bear Unitarian Universalist Church in Mahtomedi, MN where he served until 1969. For over twenty years Rev. 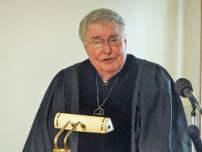 Grady served as minister of the First Parish Unitarian Universalist in Arlington, MA, retiring in 1990. Both before and after his official retirement he contributed time and effort to the denomination serving on UUA boards and committees and at the district level in education and authoring works on UU history. Our small congregation has never retained a full time minister. For speakers at our Sunday Services our program committee has drawn from our congregation and from the community at large, engaging a variety of speakers, each exploring his/her own subject. We hve engaged speakers from our faith or other faith traditions, ministers and lay leaders, artists, scientists, educators, philosophers, public servants, historians, professors, librarians, and other enthusiasts. When we could we retained a part-time minister for one sermon a month and to minister to the congregation and perform ceremonies. Rev. Chuck Thomas remains the closest thing to a full time minister with whom the Fellowship has ever been graced. In 2014 Rev. Chuck Thomas retired after more than twenty years of once-a-month sermons with our congregation. Our fellowship is one of nearly 1100 Unitarian Universalist congregations in North America. We are a member of the national Unitarian Universalist Association of Congregations and have been designated by the UUA as an official Welcoming Congregation for those of all sexual orientation. We of the UU Fellowship of Lima welcome visitors attending our weekly services and encourage them to participate in informal discussion following the service. 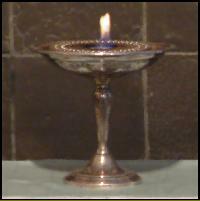 Our Covenant, re-dedicating us in every Sunday service, has remained unchanged since our beginning. 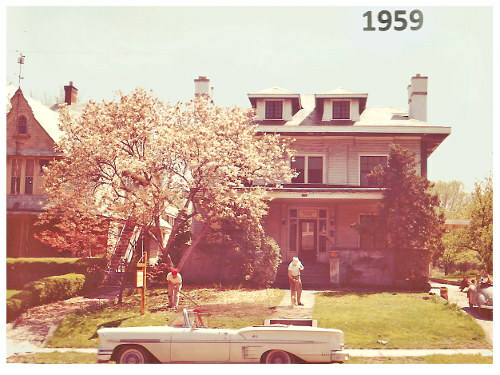 Our Fellowship House in 1959. One of many stately old houses then on Market St.
Family Picnic. 1992. 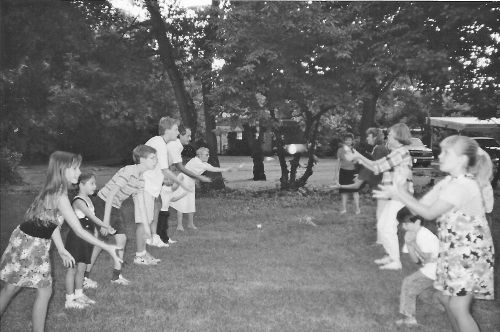 UU Lima members playing in the back yard. Dedication of the new ramp for step free access. 2001.